"Mathematics is of central importance to modern society. It is essential in the physical sciences, technology, business, financial services and many areas of ICT. It is also of growing importance in biology, medicine and many of the social sciences. Mathematics forms the basis of most scientific and industrial research and development. Increasingly, many complex systems and structures in the modern world can only be understood using mathematics, and much of the design and control of high-technology systems depends on mathematical inputs and outputs." Maths is taught through a daily Numeracy lesson. We attach great importance to children achieving and understanding mathematical processes, concepts and skills. 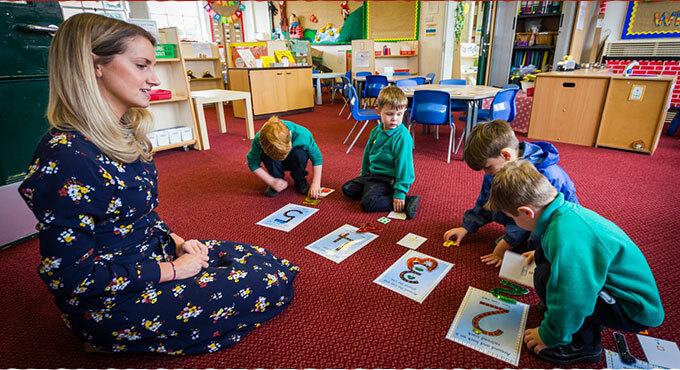 There is a strong emphasis on the development of mental arithmetic and we provide opportunities for pupils to use and apply mathematics in real life situations. Class teachers plan for opportunities to develop and apply key mathematical skills in other subjects throughout the year. All staff encourage a positive attitude by teaching visually, kinaesthetically, and aurally so catering for different learning styles, and by presenting work in a fun and enjoyable way. Children are encouraged to actively participate in their learning process, which creates a sense of achievement and confidence. Children work in differentiated groups, where they can be supported while they gain confidence. Most classes will have between 3 and 5 groups. We strive to help children in their journey to become confident competent mathematicians. enable children to work independently and collaboratively with a partner or in small groups.